The National Religious Campaign Against Torture has named June as Torture Awareness Month, with a focus on “confronting the culture of torture” in the United States. As part of that campaign, we recognize a significant step in the struggle against torture that occurred June 28, 2010, two years ago today. On that day, here in Chicago, former Chicago Police Commander Jon Burge was convicted in criminal court as a result of the torture he and other detectives committed against African American suspects. The trial and subsequent conviction were the culmination of decades of work by community members, activists and lawyers fighting for justice for the more than 110 torture survivors. 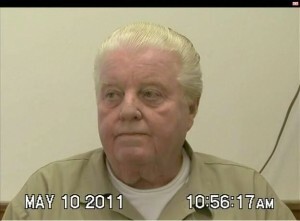 The criminal trial began in late May 2010 in Federal District Court, in front of Judge Joan Lefkow, with Burge facing charges of perjury and of obstruction of justice The charges resulted from Burge lying under oath when he denied involvement with, or knowledge of torture by, Chicago Police. As a result of decades of cover up, and the willful refusal of State’s attorneys Richard Daley and Richard Devine to prosecute, the statute of limitations had run on the incidents of torture and he was not charged for the underlying physical acts. Lawyers and legal workers from People’s Law Office (PLO) were present in the court room throughout the trial, observing as evidence was laid out demonstrating the pattern and practice of torture that occurred during Burge’s rein at the Chicago Police Department. A PLO attorney also gave made daily reports on the most powerful African-American radio station and PLO lawyers and their torture survivor clients also made regular comments to the press. We watched as a detective under Burge’s command attempted to explain away his prior admission that he witnessed Burge torture Shaded Mumin We watched as Burge took the stand and audaciously continued to perjure himself, denying any and all allegations of torture. We watched as our clients and other torture survivors, testified against Burge, recounting and reliving the difficult and painful memories of the torture they experienced at the hands of Chicago Police. Much of the testimony and evidence presented at trial was interwoven with the work PLO has done on the Chicago Police Torture cases for over 25 years, including torture survivors and other witnesses we identified as part of our investigation, along with the testimony from Andrew Wilson’s civil rights lawsuit, where he was represented by PLO attorneys. At moments, it was somewhat challenging to just sit and watch a case we were so invested in be tried by other attorneys, particularly when their strategy differed from how we may have proceeded. For example, our approach to these cases has always focused on the racist nature of the torture, which took a back seat in the prosecution’s case against Burge. It was also disturbing to hear Burge’s lawyers outrageously contend that PLO lawyers and their clients had fabricated the entire scandal. Ultimately, however, it was rewarding to see that the work we had done for decades was being utilized and we hoped it would lead to holding Burge accountable. While the jury was deliberating, members of People’s Law Office were present at the court house, anxiously awaiting a verdict. During those two days, we wondered whether the predominantly white jury would find Burge guilty or, like so many others throughout the years, ignore the mountain of evidence and condone the actions of police officers committing heinous acts against poor people of color. On June 28, 2010, two years ago to this day, we were in the court room to hear the jury come back with a verdict of “Guilty” on all three counts. As a law firm that has spent over forty years fighting against the racism and injustice that is part of the criminal legal system, we do not view the prison-industrial complex as a solution to social problems and we recognize that justice does not come from locking people up in cages. So our recognition of this conviction is not a celebration that Burge is in prison so much as it is an acknowledgement of another highlight in the decades of struggle by torture survivors, their families and their communities, along with activists and attorneys that have fought alongside them. Furthermore, this conviction was another wave in reversing the tide of misinformation, cover up and outright lies that have defined the issue of Chicago Police Torture over the years. Those committed to justice in these cases can be emboldened by the fact that twelve jurors unanimously determined that torture took place at Area 2 Police Station and that Jon Burge played predominant a role in it. This is the same conclusion that has been found by numerous judges, Chicago City Council members, the Cook County Board of Commissioners and International Human Rights entities, such as the Inter American Commission for Human Rights and the United Nations Committee Against Torture. No longer can the evidence of torture be dismissed as “allegations” or Burge be referred to as an “accused” torturer. The conviction of Burge should not be considered an end result, but rather another step in the continuing struggle for justice for torture survivors. These past two years have seen advancements in the political, legal and organizing work. Torture survivors have been granted new hearings, exonerations, and released from prison, civil rights lawsuits have continued, a federal judge has held Daley as a defendant in one of the cases, resolutions have been brought locally and nationally and new projects such as the Torture Justice Memorial Project have been founded. There are certain demands that have been raised by torture survivors and other community members as part of the struggle for justice in these cases. We must continue to demand new hearings and the release of torture survivors behind bars, as there are at least 15 men in prison as a result of tortured confessions. The U.S. Attorney must indict Burge’s confederates who are under federal investigation. In addition, the City of Chicago should pay reparations to the torture survivors, particularly those unable to file civil lawsuits, along with providing funding for a program that will provide psychological treatment for survivors, their families and communities that continue to deal with the trauma of the torture scandal. The City should also settle the pending civil suits on behalf of torture victims, stop using tax dollars to defend against the suits and stop payment of Burge’s pension, along with the other detectives who have been implicated in torture. The Mayor must apologize to the torture survivors, their families and the African American community, and the U.S. Congress should pass the Law Enforcement Torture Prevention Act. On this day, we think back not only on that day two years ago, but on every other day that has been a step in the long road toward justice in these cases.